Axor Starck Organic is a collection that appeals to heart and intellect in equal measure: the organic minimalist design is bursting with sensuality and energy, and runs through the entire collection – from the wash basin mixers to the accessories. The new mixer shower jet guarantees a sensual water experience and is economical in terms of consumption, while the control concept of the wash basin mixers ensures that water is used responsibly, and the ergonomics are impressive. In addition to the collection's functional and ecological advantages, it can also be combined in versatile ways: Axor Starck Organic blends harmoniously into different ambiences. Thanks to their new mixer shower jet, Axor Starck Organic wash basin mixers offer a highly sensual water experience. The design, which runs through the entire collection, has a powerful, sculptural presence, while the handles are ergonomic and blend in harmoniously in any position. The basin mixers come in different heights and as complementary solutions for the wall. Axor Starck Organic also offers bathroom mixers for the shower and the bath tub. Thanks to its organic minimalist design language, the collection can be integrated quite naturally into different ambiences. 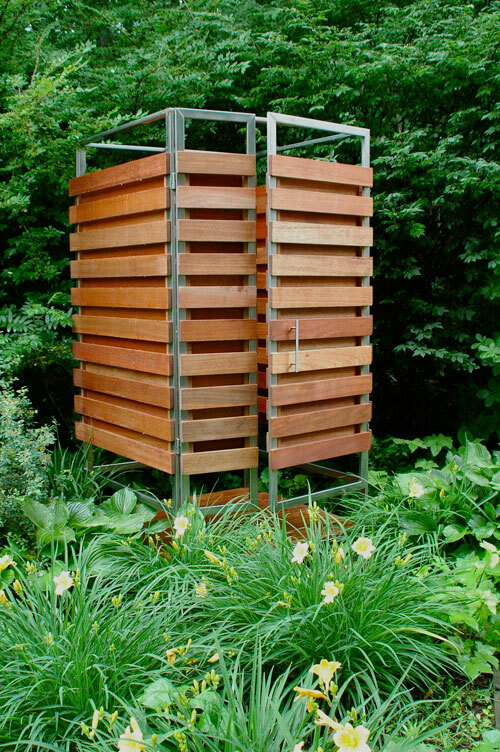 If you live in warmer climates or just have the desire to shower under a blue sky, you’re in luck because they aren’t just for beach houses anymore. The Oborain can be set up anywhere outside for temporary or permanent use and it easily assembles in 30 minutes. 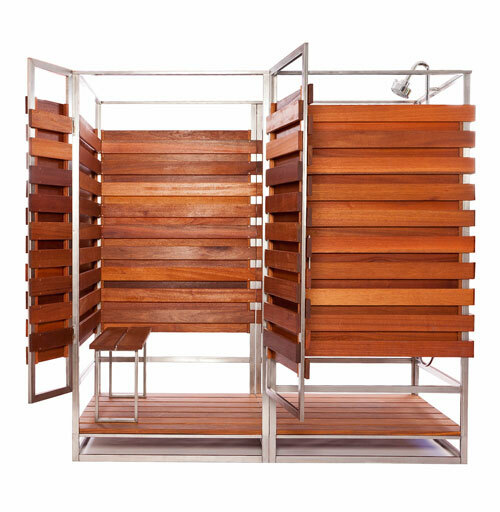 Handcrafted and made from sustainable hardwoods, the sleek design is meant to last for years and years of outdoor showering fun. The stainless steel frame polishes off the modern design and each comes outfitted with an Axor Citterio 3-jet showerhead. Available for one, two, or three people (insert you own joke here). Craving a way to make traditional slow-cooked barbecue at home? Broilmaster’s new Qrave Grill may be the most versatile gas outdoor cooking system you can buy. With electronic ignition, oval burner and dual controls, the Qrave (pronounced “Crave”) adjusts from as low as 7,500 Btu – for low-slow cooking and smoking – and can still crank up to 25,000 Btu – for grilling and steaming. The stainless steel chip drawer slides out so you can add chips without opening the grill. The stainless steel drip tray catches all the drippings to eliminates flare-ups. Most of the drippings vaporize to produce flavorful smoke, while any excess liquids flow to the external drip bucket. Close the drain valve and fill the drip tray with water or other liquid to steam seafood and vegetables. 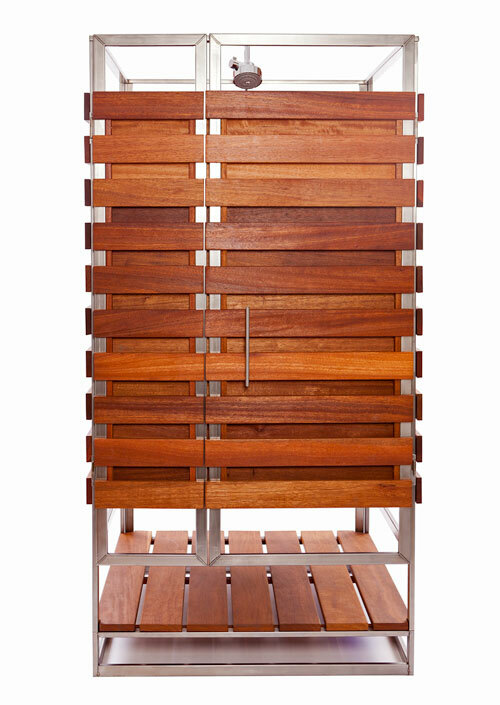 The deep aluminum casting creates natural convection for exceptional heat and smoke circulation. The 1/4-inch thick casting maintains a consistent temperature all day and all night. A new precision probe heat indicator monitors the temperature and can even be re-calibrated in your kitchen to ensure accuracy. Qrave Grill heads fit all Broilmaster carts, posts, shelves and side burners. Choose LP or Natural Gas. A special package model – in LP only – ships in one carton with a black cart and one side shelf. Hansgrohe is making a big splash in the shower and rolling out several innovative new products for 2012. These introductions are sure to be a game-changer when it comes to remodeling. A global leader in this category, the brand is bringing a trio of sleek and unique showerpipes stateside. In vogue in Europe, the exposed systems are elegant, easily serviceable and perfect for renovation projects. Hansgrohe is also expanding its popular Raindance® collection, which will now include a new handshower. d water flow. It was designed in keeping with the body’s natural contours, thereby providing maximum coverage. The showerpipe and all components come in chrome or a chrome/white dual finish. LACAVA’s Spiro Faucet emerges as the language of art – at once a ribbon flowing and rolling, swirling, and arching. The faucet’s spout embodies a dance, like a ballet dancer engaged in a graceful movement, turning and leaping into elongated, unpredictable, and subtle lines. The Spiro collection features lever handles and thin rectangular spouts and backplates on deck-mount single-hole, three-hole, and wall-mount faucets for washbasins, as well as corresponding shower and tub valves. Now this is just a twisted sick faucet by Lacava. The design of Lacava’s Spiro Faucet resembles a twisted ribbon. The faucet’s spout turns and arches into subtle lines. Finished in classic chrome, the faucet is available as a deck-mount single-hole or three-hole faucet, with one-lever handle or two-knob handle options, as well as a wall-mount. The Best Time to Build? Why Choose a Wall- Mounted Toilet - Can You Say "Hands Free"?